Enjoy Spanish cuisine at El Acebuche, a restaurant where you can enjoy drinks at the bar, take in the garden view, and even dine alfresco. You can also stay in and take advantage of the room service (during limited hours). Wrap up your day with a drink at the poolside bar. Buffet breakfasts are available daily from 7 AM to 10:30 AM for a fee. Don't miss out on the many recreational opportunities, including an outdoor pool, an indoor pool, and a sauna. This hotel also features complimentary wireless Internet access, an arcade/game room, and wedding services. Placed in a wonderfull place, the sights from our balconies enter the waters of the Bay of Algeciras,where the aroma of the sea and the blue of his waters acquire principal protagonism. To only two minutes of the Rinconcillo beach, in the Bay of Algeciras and five minutes of the port and the center. The hotel viewing point this one placed in the only place to enjoy the environment of the area of Spain around the border of Gibraltar. Gibraltar, the beaches of rate, the nature reserve, the strait of Gibraltar. These are some examples of the places which it will be able to enjoy from the hotel. 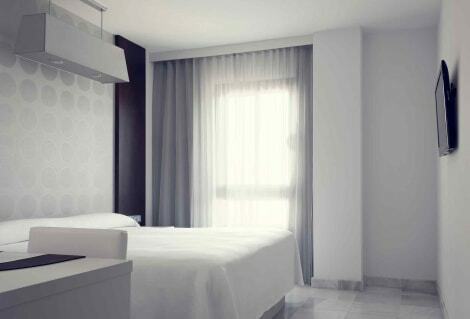 The rooms of the hotel are equippade in order that the stay of our clients turn out to have the most nicer sensation. The Mercure Algeciras hotel is located 5 minutes from the center of Algeciras, the city's port and Rinconcillo beach, 20 minutes from Sotogrande and 30 minutes from Tarifa. Its 73 modern and sophisticated rooms are equipped with all the necessary comforts to make sure you enjoy an unforgettable stay: Free WIFI, fitness center and classes, restaurant with indoor courtyard, buffet breakfast and bar/cafe. Ideal for visiting Los Alcornocales Natural Park or beaches like the one in Getares. Guests who stay in this hotel will enjoy the comfort of modern rooms, decorated in a contemporary style and with attention to detail, offering a perfect atmosphere to relax after a busy day of sightseeing. The reception is available 24 hours a day and the hotel provides a functional meeting room, equipped with modern facilities to ensure that guests can keep working productively. Enjoy a meal at the restaurant or snacks in the coffee shop/café. The hotel also offers room service (during limited hours). Wrap up your day with a drink at the bar/lounge. Buffet breakfasts are available daily from 7 AM to 10:30 AM for a fee. Take advantage of the hotel's room service (during limited hours). Quench your thirst with your favorite drink at the bar/lounge. Buffet breakfasts are available daily for a fee. lastminute.com has a fantastic range of hotels in Algeciras, with everything from cheap hotels to luxurious five star accommodation available. We like to live up to our last minute name so remember you can book any one of our excellent Algeciras hotels up until midnight and stay the same night.